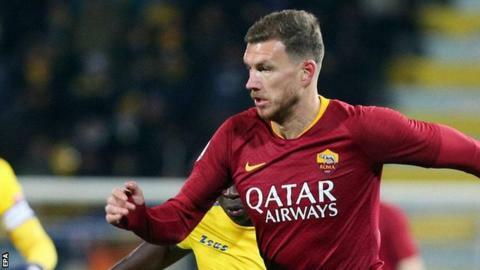 Ex-Manchester City striker Edin Dzeko scored a 95th-minute winner as Roma nicked victory over struggling Frosinone to maintain their push for a top-four finish in Serie A.
Frosinone, who are second bottom, took a fifth-minute lead through Camillo Ciano. Goals from Dzeko and Lorenzo Pellegrini within a matter of seconds around the half-hour mark swung the match in Roma's favour. The home side must have thought they had done enough for a point when teenage forward Andrea Pinamonti levelled with 10 minutes left. However, Dzeko denied them a priceless point by bundling in the late winner from close range. The Giallorossi remain in fifth place, but are now just a point behind fourth-placed AC Milan.